The black-capped chickadee is a popular and beloved bird—and for good reason. Its “dee-dee-dee” song is very easy to hear, especially in the winter when other birds are scarce. It is also easy to identify visually, with a distinctive black cap, gray wings, and buff-colored breast. The chickadee’s feeding habits, like hanging upside-down from a low tree or feeder, are especially charming. It’s often bold enough to actually take black-oil sunflower seeds, one of its favorite foods, right out of a person’s hand. In fact, at the Morton National Wildlife Refuge, on Eastern Long Island, there’s a park where people have been bringing in seeds and hand-feeding the chickadees like this for years. The black-capped chickadee (Poecile atricapillus) is a year-round resident in our area, breeding in Prospect Park and likely in BBG’s Native Flora Garden. It is a secondary cavity nester, meaning that it finds an existing tree cavity made by a woodpecker or formed naturally through decay. Leftover sawdust in the cavity may also enhance its appeal. If it suits, the cavity will be used year after year. The nest is typically composed of grass, leaves, and moss and lined with fur. I have actually seen a chickadee land on a snoozing raccoon, pick a few hairs, and then fly off to its nest without the raccoon ever budging. Chickadees will also use a man-made nest box as long as it’s the right size. In autumn and winter, birders often watch for small groups of chickadees to form larger feeding flocks with other species. Blackpoll, pine, and magnolia warblers; red-eyed vireos; and titmice congregate with chickadees in the fall until it gets cold, when the insect-eating warblers and vireos migrate south. 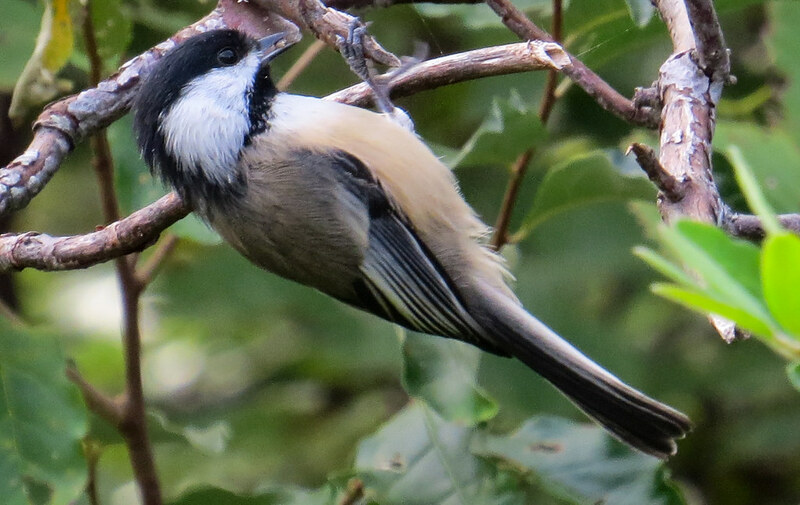 Then the local winter birds—downy woodpeckers, red-breasted and white-breasted nuthatches, golden-crowned kinglets, and brown creepers—join chickadees in these feeding flock groups. It’s thought that gathering in flocks offers safety in numbers, with many eyes protecting against predators. Indeed, chickadees are very adept at detecting raptors—like sharp-shinned and cooper’s hawks—and giving alarm calls, probably one reason the species’ population is quite healthy. The black-capped chickadee is as popular as it is common. Maine and Minnesota have both designated the species as their state bird. And the holiday card industry seems to be a fan: Chickadees are right behind the northern cardinal in popularity. With its cheerful song, year-round presence, and pretty black cap, you can see why many birders consider the chickadee a perennial favorite. The Birds of Brooklyn series looks at some of the most familiar and fascinating birds that call Kings County their habitat. Joe Giunta has led bird walks for the Nature Conservancy and the South Fork Natural History Society and taught a beginning birding course for Summer Fest. He has birded extensively in the U.S., Panama, Belize, Venezuela, and Costa Rica. 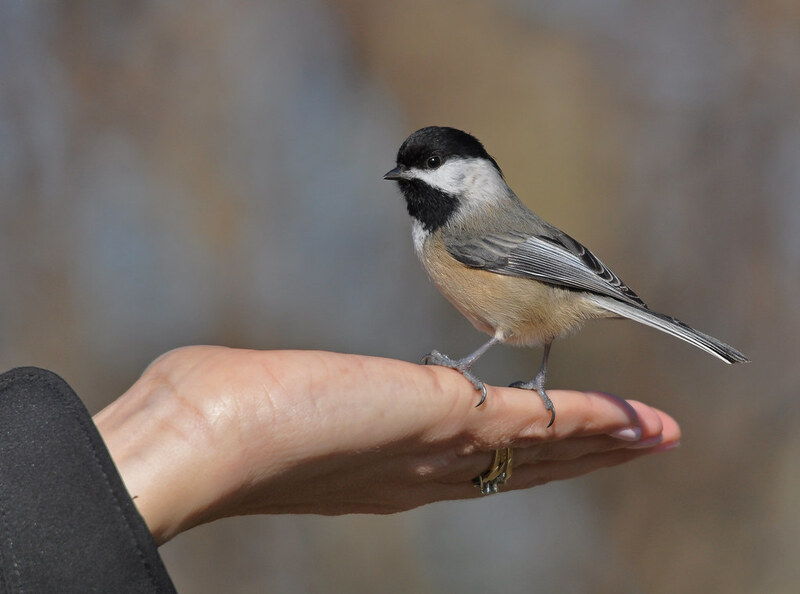 A black-capped chickadee (Poecile atricapillus) is often tame enough to sit on a person's hand. Photo by Chris. Black-capped chickadees are acrobatic enough to hang from small branches or feeders. Photo by Betsy McCully.